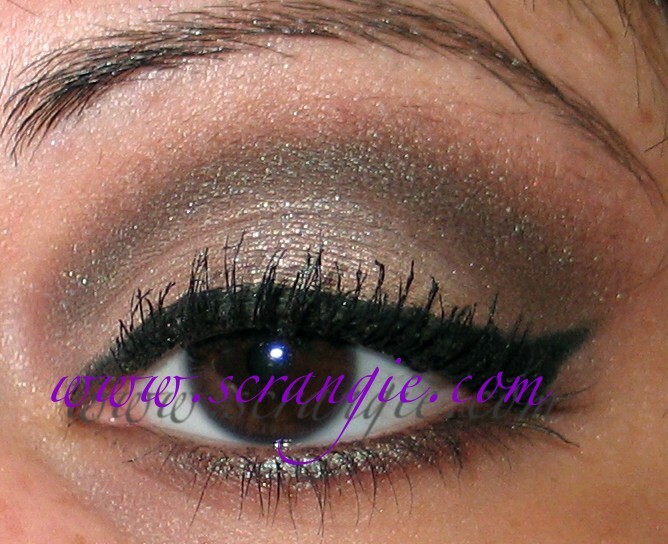 Scrangie: Eye of a couple days ago- with taupe! This one turned out surprisingly nice for such a plain look. I wore MAC Tunnel of Love Superglass with it. This was Sunday... you can see how much worse my brows have gotten in only two days! I've been using a lot of Fyrinnae lately. I decided to try them again after trying them a few years ago and not having much luck. I'm trying to incorporate one new (to me) Fyrinnae color into my look every day. I still can't get every color to work for me/apply perfectly but I'm really enjoying a lot of them. Species 8472 is a subtle taupe with a lot of little sparkles that don't really show up, so I put some Equality on top to satisfy my sparkle craving. Bare Escentuals Creme de Menthe has green sparkles on a warm brown base, but I still needed more. Creme de Menthe reminds me a little of MAC Club. I like taupe. I feel like I'm always wearing taupe and grey, purple and grey and green and yellow combinations. Which is cool, because I think those colors suit me well, but maybe I need more variety. I need to do a blue look or a pink look this week or something. Mix it up a little. Hm. So you not only have beautiful nails, but you do incredible makeup looks too??? Color me green with envy!!! I am loving the makeup combos you've been posting! Taupe goes with everything...this is sooo pretty! Your eye makeup always looks so gorgeous! soooo gorgeous!! i love the colours and how amazing it looks with your eye color! I like the look! I often find taupes and browns the hardest shades to work with. I'm so glad you're trying Fyrinnae again. I <3 them. Your eye makeup is great. I'd love it if you did a video on your application and products used. Eyeliner application is perfect too. You're making me look at my BE in a new way. I'd never considered using Cherry Choco Truffle in the crease, and now this look with Creme de Menthe. I like taupe, and other "plainer" colors-even though I could wear crazy colors, I just like the simplicity. I love your makeup post- you have the prettiest eyes, I swear. What brush do you use to apply the fluidline? Sugarrpop, thanks!! :D I use MAC 209SE, which seems to have a stiffer, pointier tip than the regular 209! This is a beautiful classic look. I adore your makeup! I pull something from my eyebrows every darn day. It really irks me that they grow so darn fast. My girlfriend had these nice thick eyebrows when she was younger. She plucked her brows out in clumps. Her brows haven't grown back. She had thin brows and is so frustrated by them. *squee* you know Species 8472 was made for me, right? I'm so flattered that you're wearing it! It's like, "zomg one of my idols is wearing my eyeshadow, I can die happy now!" Joey, of course! That's why I bought it :D It rocks!! Awesome shadow! I agree with whoever said you should do a video. This is definitely not a plain look for me though, I love it!